This is my current home-made solar powered car exhaust fan for my car which has been without air conditioning for the last couple of years (thank you, Honda, for offering me a whopping $100 towards my $4000 in needed repairs). What this does is expel air from the car through the cracked sun-roof or side window when the temperatures are the hottest which, coincidentally, corresponds to when the sun is out. You can fool yourself with those Mylar sun shades. What you need is technology with the right amount of juice. The cheap, as-seen-on-TV model that has a solar panel the size of credit card just can't provide the energy needed to move enough air in your vehicle. 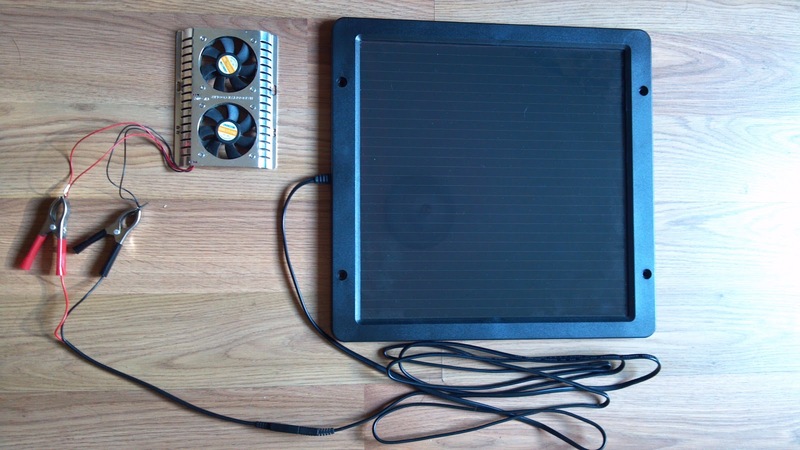 This 5-watt panel is only $40 (usually used to "trickle charge" a car battery) and kicks out at least a half-amp, obviously depending on the solar conditions. However, even in cloudy weather through a tinted car window, it still powers the dual fans I reclaimed from an old computer. All you need to do is attach the clamps to the color matched wires of a 12 volt computer fan and now we are in business. There might be enough power from this panel to operate a freezer that uses a Stirling engine, though I don't know where that would get me exactly. Being a worry wart, I wondered about risk of sparks or something like that, but the panel has an automatic trip if the red and black cross that shuts down all current. I've been running this set-up for a couple of months now, a couple times a week with no apparent ill effects. That being said, I divulge myself of liability and recommend you consult your doctor before beginning any exercise routine. I did make one improvement from this picture: the black panel casing gets hot in the sun (duh! ), so I covered it with white duct tape all the way around. Or you could you use paint, but it has to be rated for full sun exposure and above average temperatures. I also switched back to a single 12V computer fan instead of the dual seen here.